WhatsBeautiful to you? I've been thinking about this quite a bit lately. 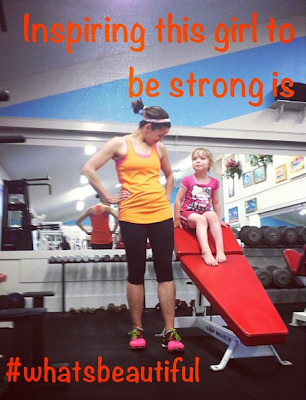 Inspiring and Involving my kids in fitness. I wouldn't be who am I today if it weren't for my children. I want to be a better, healthier person for them. They are what makes me beautiful. Disclaimer: I’m part of the Under Armour campaign through Fitfluential. Right on! I think that is beautiful too. Great picture of you two. Gotta love when action is behind the words! YEAH! LOL - wrong social media. I was looking for the "Like" button. You inspire your children every day, but you also inspire other young women to be strong every day as well. Think of all the young girls you encounter each day who may not have someone that inspires them to be strong women, inside and out. You are that person to so many people!! !